Petty's Meats (2141 W. State Road 434 in Longwood, FL), which opened in 1979, has been one of my favorite local businesses since I moved here more than 20 years ago. The market offers at least a little bit of just about anything you would hope to find while grocery shopping; its selection of meats, salads (vegetable, pasta, antipasto, meat and bean salads are just a few of the varieties offered), soups, sandwiches (more on that later in this entry), cheeses, sauces, spices, spreads/dips, beers, wines and desserts are among the best, if not the best, in central Florida. Upon entering the market, you are likely to be greeted by a friendly employee at the counter just inside the front door, and then again by a multitude of aromas and visual delights. One of your first few stops during a visit to Petty's should be the soup and dip/cheese samples to the left of the entrance. (The soup samples are to your immediate left upon entering, just inside the front door, whereas the dip/cheese samples are adjacent to the cheeses; see below.) These samples change on what I believe is a daily basis, and everything that I've sampled has been excellent. During one recent visit, there was an excellent horseradish cheese that I sampled. A chipotle dip was available for sampling during a trip I made here last week; it was so good that I bought an entire container of it (for around $3.75, if I'm not mistaken). You won't want to miss the dessert counter, which surrounds the cash register area as you enter, but I'll get back to that in a moment. The selection of cheeses is outstanding. I generally spend 5-10 minutes during each visit reveling in the display of cheeses. If there's something you're looking for but don't see it, be sure to ask the employee who works near the dip/cheese sampling counter. They can quickly locate it in the display, and if it's not in stock then it can be ordered. Halloumi cheese, which has been a favorite of mine for the past year, usually is sold here. Petty's didn't have it in during one of my visits earlier this year, but a helpful employee ordered it for me and it was in stock within a matter of days. This is just one example of the exemplary customer service the market provides. Toward the rear of the store is the market's beer and wine selection, which is impressive. There is a lot from which to choose, and the department's employee (look for the gentleman in the store's rear corner) is almost always there to answer any questions you may have. Petty's stocks some beer that I have not seen even at Total Wine, so there are some hidden gems and rarities here. Wine is not my forte, but it does seem that the market would be an excellent source for local aficionados of wine. The market hosts beer and wine tastings; check its website (http://www.pettysmeats.com) for further details. While you're back in this section of the store, be sure to help yourself to some free beer samples (see below). The last time I was here, Narragansett was on tap. Not the best beer in the store, by any means, but it'll suffice as you continue your visit. A great micro-brew to look for in the refrigerated section (adjacent to the beer shelves and sampling section) is Bell's Two-Hearted Ale, which recently was rated as the # 2 craft beer (out of 50) in the country by Zymurgy Magazine. Petty's sells individual bottles of this for roughly $2 plus change. If you enjoy soft drinks, you'll love the selection of Sprecher sodas, as well. My personal favorite flavors are Orange Dream and Blueberry. Petty's carries both, though Blueberry is seasonal and may not always be in stock. En route to the other end of the store and along the rear wall is the meat and seafood counter. The selection is thorough. If you're looking for fresh meats and seafood and aren't impressed with what other stores in the area offer, Petty's likely is an upgrade. The end of the store opposite of where its beer and wine are is, to me, its main attraction. This is where Petty's features its cold cuts, sandwiches, salads, breads, seasonings and spices. I don't eat cold cuts much, but one of my current favorite sandwiches is the market's Cajun Turkey Focaccia (Cajun turkey breast topped with Muenster cheese, the market's own "No-Name" cheese spread and caramelized red onions) sandwich. I've had it a few times over the past couple of months and it seems to get better each time. The sandwich, which is $6.99, is served hot and is delicious. Cheese steak, Cuban, Reuben, Club and French Dip sandwiches also are on the menu. I have tried only the Club, Reuben and Cajun Turkey Focaccia sandwiches, as far as I can remember, but I'd be willing to bet that all of the other sandwiches are tremendous. According to its website, the "sandwich of the week" this week is roast beef, bacon and Cheddar cheese on a pretzel bun with mustard, mayonnaise, lettuce and tomato & a side of red potato salad (and a pickle). In a weird way, I wish I didn't just see that ... now I desperately want it. I might have mine with turkey and not roast beef, but either way I'm sure it's out of this world. The display of salads is shown in the center picture above. 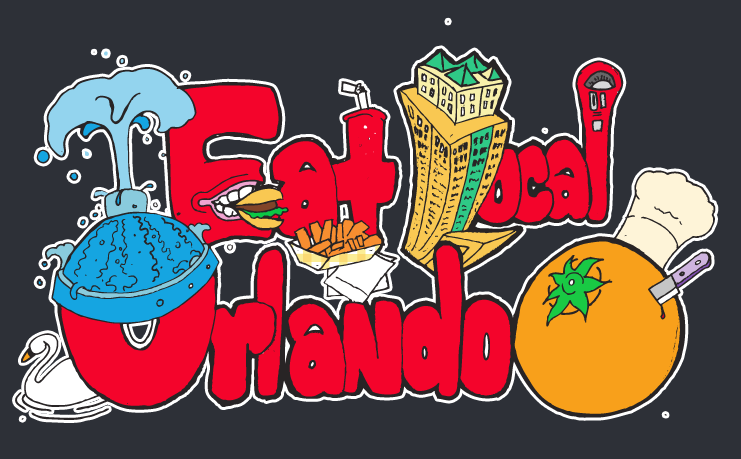 The market offers a comprehensive selection of salads as well as such other sides as empanadas, egg rolls, stuffed peppers and mushrooms, chicken fingers ... if you can imagine it, it probably is there. If you don't see it, don't hesitate to ask about it. Petty's often has a curry chicken salad that I like, and during one visit I didn't see it. I asked about it and I was told they'd make it for me and call me when it was ready. I received a call a day or two later and immediately went to pick it up. That's another example of how the market's employees go above and beyond to provide for their customers. If you're into spicy flavors, do not miss the shelves adjacent to the deli counter. This is where you can find spicy salsas, spreads, seasonings, dressings, olives, pickles and more. I love spicy foods and flavors, so I spend a good deal of time perusing this area. There likely are things on these shelves that can't be found at Publix, etc., so be sure to check this section out if you're looking to put a unique "kick" into your cooking. At the very end of the display of salads/etc. 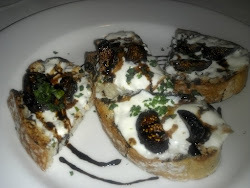 is where the market's garlic & Parmesan bread is (see below). I love this stuff. It's a little greasy, but it's delicious. Consider buying one, though you may regret not buying two if you get home with only one. One bite of this bread at home may make you head right back to Petty's to pick up more. I believe each piece is barely more than $1, so it's a worthwhile investment to pick up a couple. I don't purchase desserts from Petty's all too often, but the dessert counter (below) offers many delicacies and potential temptations. As is the case with the market's other departments, the dessert section offers just about anything you can imagine: pastries, brownies, cannolis, cakes, pies, cookies, cheesecakes, candied fruits ... it's confection heaven. Hopefully I have this right, but I remember purchasing a piece of Grand Marnier-flavored cheesecake here not long ago. 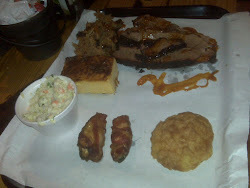 It was delicious and will be one of the first things I look for during my next visit, now that it's on my mind. For further information, follow Petty's on Facebook (https://www.facebook.com/pages/Pettys-Meats/132852030090270) and visit its website (http://www.pettysmeats.com). 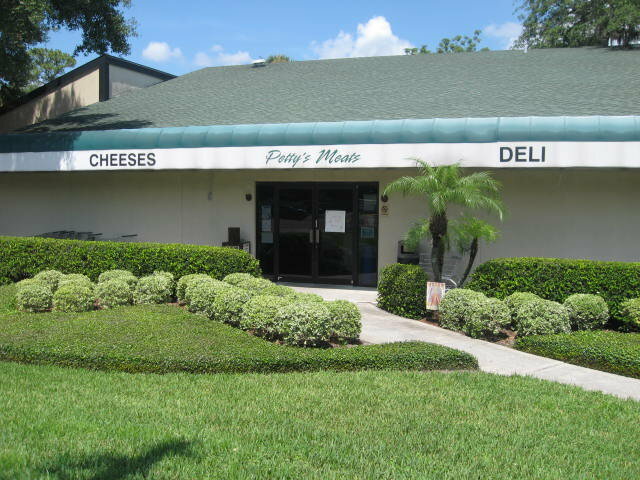 Petty's is located on 434 just west of I-4 on the north side of the road and has a pleasant outdoor seating area to enjoy your lunch sandwich or salad.